Artwork 'No Image Available', an online edition made specifically for viewing via the internet. This online work from the project 'No Image Available' consists of an infinite series of 'blank images'. Martijn Sandberg has taken these out of their original context, just as one would encounter them on the internet, to import them into a site-specific internet work made of 'empty images'. 'No Image Available', online artwork, 2007. 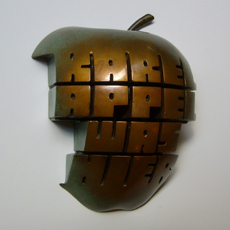 Martijn Sandberg has created a bronze artwork in the form of a half eaten golden coloured apple as gable sign for the Karel Appel House, Dapperstraat 7, Amsterdam. The text 'Karel Appel Was Hier' has been bitten out of the apple. The design of the motif for the seven parcel post boxes by the Amsterdam visual artist Martijn Sandberg consists of two layers. The basis is a grey raster pattern, derived from the familiar packing material plastic bubble foil. 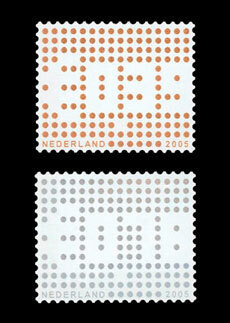 TPG Post has issued two postage stamps in 2005, that are designed by Martijn Sandberg. Postage value of the stamps is 39 euro cents, or 78 euro cents respectively. 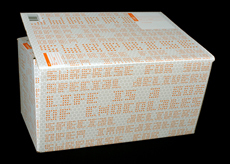 The stamps are printed on rolls of 100 self-adhesive stamps.